No events from 100 years ago this time. Instead a review of the events of 70 years ago – actually not quite. It seemed more appropriate to look at a year when the last October financial collapse happened - 1929. This will take up most of the special feature space. What Do You Know features some follow up on past features on 30s artist Howard Leigh, so there is a general 1930s theme here. Another link to the 1930s was founder member Ray Billings who died at the end of September. A short piece recalls his own memories of Croydon and his postcard publishing activities. 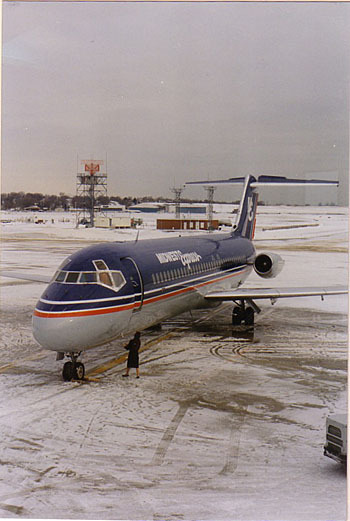 The cover picture of a Midway Express DC-9 at Milwaukee, April 1993, is sort of seasonal. It is actually a private photo by myself, but converted to a postcard by a method copyrighted by a French company Picty, whereby a photo is mounted on a pC-backed card and overlaid with a plastic laminate. A modern version of the old postcard-backed-private photo which individual collectors may or may not regard as legitimate postcards. So, it just remains to wish all a happy Christmas and that, given that the most severe Chinese curse was supposed to be "May you live in interesting times", 2009 to be less interesting.